Bulk Barn has a new Flash Sale coming up! 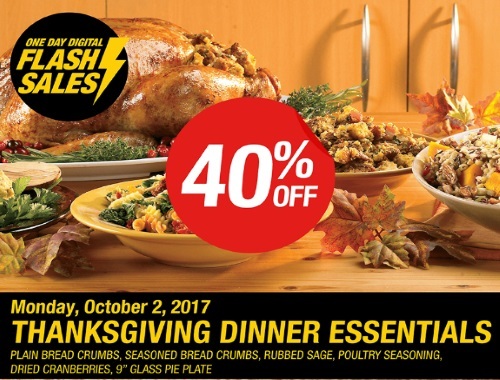 Get prepared for Thanksgiving with this coupon for 40% off plain bread crumbs, seasoned bread crumbs, rubbed sage, poultry seasoning, dried cranberries and 9"glass pie plate! Coupon must be presented before your purchase in order to get the discount. Show it on your mobile phone at the link below. Offer valid Monday, October 2, 2017 only.